Whoop! Whoop! Another fantastic weekend away with the Forres Big Choir - or some of us - at the magnificent Dun Flodigarry Hostel on Skye. Some truly beautiful singing with, once again, magnificent weather with some glorious sunrises. Several late cancellations reduced our numbers but definitely not our enthusiasm. Next year is booked already! Those of us who went to Flodigarry are wallowing in the post deliciousness of another wonderful long weekend away with good weather once again (though, truth be told, not wall-to-wall sunshine as per the first two years - but there was still singing outside).. . The fine weather encourages early morning strolls down to the beach and longer excursions in the afternoons. Late night chats and revelry were enjoyed by many of us, aided by the odd glass of something – or cup of hot chocolate. For many years on Skye, we have been able to sing outside for some of the time and, with the sea as still as a millpond, all seemed well with the world. As ever we love these opportunities to get to know each other better and we look forward to something similar next year. The hostel suits us perfectly. 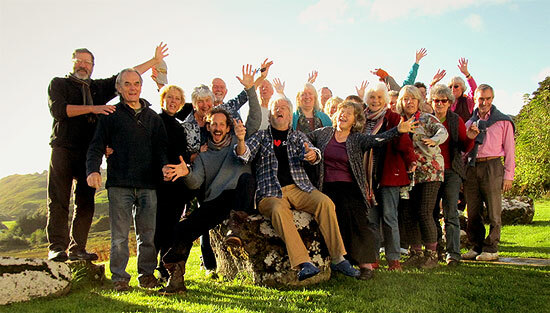 Hosts Gavin and Annabelle Scott Moncrieff, who we met through Gavin's daughter and former choir member Jo, have sung with Bill and Kate on their annual singing workshop on Eigg and were extremely welcoming. These trips always serve to deepen the bonds of affection between choir members and to remind us how lucky we are to be singing together. 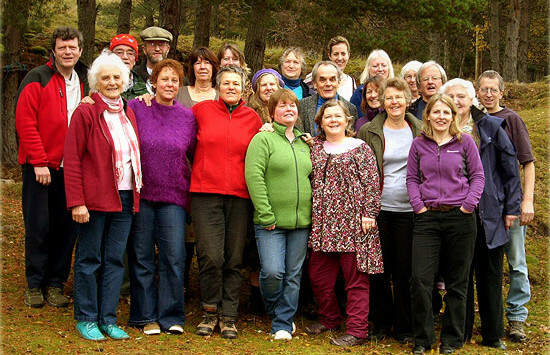 Following the great success of our Trips in 2010 and 2011, in 2012 we stayed for a third time at the comfortable and welcoming Slochd Mhor Lodge hostel near Carrbridge for a weekend of singing and friendship, relaxing and walking. And, not only judging by the levels of noise we produced, both singing and talking, we all had a wonderful time! 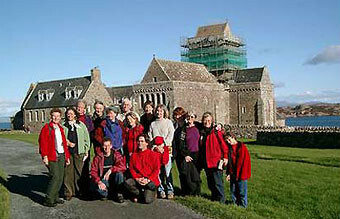 Our first Choir Trip was a long weekend on Iona in Spring 2005. We sang in the Abbey on Sunday to an audience of around 80. The same year we went back for a Monday to Saturday in October. We again sang in the Abbey, but this time not as a performance. By now a tradition, we revisited in 2006, when we were blessed with five days of great weather. In spite of it being a non-official concert, we sang for more than 60 people in the Abbey on Thursday. In 2007 and 2008 we made more successful visits to the island. Unfortunately, in 2009 the annual trip was cancelled because too few members signed up, so we were unable to book the hostel. Iona is a very special place. We stayed in the superb hostel. All trips we were lucky to have good weather generally, inviting us to explore the island and its beautiful coasts.